Whilst there were no announcements of new hardware (a new iPad Air and iPad mini were sneakily released last week with an agreeable spec bump), Apple’s Show Time event presented several surprises alongside the expected revelations. The keynote was delivered in four phases, covering updates to Apple News, Apple Pay, the App Store and Apple TV. 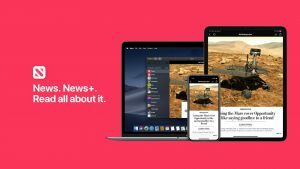 The first announcement of the event arrived in the form of Apple News+, a new subscription-based service that grants users unlimited access to a range of newspapers and journals. Alongside the existing publications on offer, Apple are bringing over 300 magazines into play too. Time, Vanity Fair and WIRED make up just 1% of the titles on offer, all accessible with a News+ subscription. The slick interface has been given a boost of charisma with the introduction of animated covers and rejuvenated article layouts. The app’s design has been constructed to suit a variety of contexts, whether it is being viewed on a handset, tablet or desktop. The subscription will cost $9.99, so it is likely that this will be the same in pound sterling. The subscription can be shared across users that are part of a broader Family Sharing network. They revolutionised the mobile phone, conquered the tablet market, and dominated the smartwatch industry. They’ve now come to occupy your wallet. Apple Pay is a resoundingly popular contemporary payment method. A whopping 85% of retailers accept it in the UK. (We are a bit behind Australia, though… they’re boasting a whopping 99%.) On the back of this success, the Cupertino company are bringing a new offering to the financial table in the form of the Apple Card. 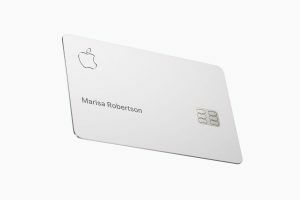 The Apple Card is a result of a collaboration by Goldman Sachs, Mastercard and, of course, Apple. The credit card will offer low, competitive rates, and rewards in the form of Daily Cash. It will also avoid any sign up or late fees. Rather than giving cashback on purchases once a month, cashback will be granted daily. The current rates are 3% cashback when spending with Apple, 2% on Apple Pay purchases, and 1% when using the card itself. The card itself is made from titanium, and comprises a laser etched Apple logo along with the name of the user. Very few details contribute to the minimalist design. There is no card number, no signature requirement, and no CVV. A virtual card number can be found in the Wallet app, along with a breakdown of expenditure by category. All this adds an additional layer of security. The new card is expected to arrive in the US this summer, with the UK release schedule unannounced as of yet. 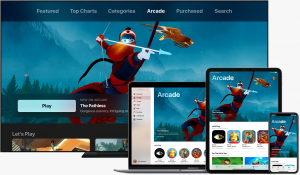 This seems to be the year of the subscription model, as yet another pay-monthly service will arrive in the form of Apple Arcade. Arriving in the UK this autumn, users will have access to over 100 games, some of which boast console-quality gameplay. One new game that is joining the roster is Beyond a Steel Sky, developed by our York neighbours Revolution Software. The distinctive artistic style will look stunning in 4K, and many fans of 1994’s Beneath a Steel Sky will be thrilled that it is finally getting a sequel. You can see a sneak peak with Revolution Software’s co-founder, Charles Cecil, along with other Apple Arcade games here. Subscribers will have unlimited access to this full library of games, and progress is shared across devices – so if a game is started on iPhone, then switched to MacBook, users can simply pick up where they left off. Better still, offline capability is on offer, unlike many video game subscription services. There are no limits on how many games can be played, or for how long. With Family Sharing, a subscription can be shared amongst up to six people. The subscription price has yet to be announced. In an attempt to oppose streaming giants Netflix and Amazon Prime, a new competitor arrives in the form of Apple TV+. An eclectic mix of creatives adorned the Steve Jobs Theatre to help introduce the new streaming service. J.J. Abrams, Reece Witherspoon, Jennifer Anniston, M. Night Shyamalan and industry titan Steven Spielberg are just a small number of those who will be creating new media for the platform. The true test of this new entry into the streaming service market will be its ability to attract new users to their unique shows. Just as Stranger Things has become a Netflix flagship tv series, Apple will be hoping that Spielberg’s Amazing Stories dances to a similar tune. Apple TV will also be combining a range of different streaming channels together, so users can access their favourite sports and entertainment shows in one place. Apple TV+ will be arriving in the UK in the autumn, but no news on a subscription price has been announced. It will be exclusive to the Apple TV app. It looks like this truly is the year of subscriptions, for better or for worse. It is unlikely that News+ will make huge waves, but the real game changer is likely to TV+. Tim Cook has already amassed a core foundation of talented creatives; time will tell as to whether the service succeeds. The introduction of a credit card is another interesting decision. It will be curious to see how this performs when it is introduced to the masses. All eyes now turn to WWDC 2019, which will be kicking off on the 3rd June. Article by Connor Booth, Business Analyst at The Distance.